The law of large numbers is a principle of probability according to which the frequencies of events with the same likelihood of occurrence even out, given enough trials or instances. As the number of experiments increases, the actual ratio of outcomes will converge on the theoretical, or expected, ratio of outcomes. What this means is that if you have a trading edge which has an expected win rate of 70% then its likely that as your sample size of trades increases so does the expected probability of 70%. This means that if you did the same type of trading set up 10 times, 100 times, 1000 times and 10,000 times that the percentage win rate for each interval would stabilize around 70% as you move from 10 trades all the way up to 10,000 trades. I have run simulations of 10 trades based on a probability win of 70% and found that in some cases the overall probability of wins after 10 trades was 80%, 40%, 70%, 60%, %50. However when I ran a number of simulations for a 1000 trades I found that the outliers at 40% and 90% disappeared and I was left with multiple occurrences of 60%, 65%, 70%, 75% and 80%. If I had carried onto 10,000 I believe probably the 80% and 60% would have disappeared and I would have been left with results much closer to the 70%. This law of large numbers is so profound that even if your edge was 51%, meaning you had a slight edge, and your risk to reward was 1R, if you ran millions of trades there would be enough significant volume of trades to ensure that you were profitable despite the fact you may think that 51% to 49% is too small of an edge to be worth much difference. In fact see below see a short extract from an article about the one hedge fund in the world which has never lost more than 1 day in over 4 years. Virtu’s combination of microscopic electronic surveillance, lightning-fast algorithms, and rigorous risk management also explains why this relatively small company has become the most consistently profitable market maker in the history of electronic trading. “The discipline they apply to the wholesale market-making game is different than other firms,” says Rich Repetto, an analyst at Sandler O’Neill & Partners. The consistency with which Virtu earns a profit is almost beyond belief. From 2009 to 2014 it lost money on only one day. (The aberration happened when it missed a special dividend payment for a stock, throwing off its model and causing a seven-figure loss.) In 2014, the last year it disclosed its daily win-loss ratio, Virtu was in the black every day, generating revenue of $723.1 million and net income of $190.1 million. Rather than go for big trades that could blow up and lose a lot of money, Virtu prides itself on making small amounts—as in $10—millions of times a day. Between the Watcher’s sporadic warnings on that Friday in May, the company was making markets in gold exchange-traded funds and futures. Over a series of 23 transactions in Chicago and New York, it earned all of $36. “They’re consistently profitable in an area that’s not known for that,” Repetto says. Profitability, however, hasn’t prevented the company’s share price from slumping since its initial public offering in 2015. What the company wants to do over and over is to sell to buyers and buy from sellers, not take positions of its own, and either hedge its risks at the end of the day or go home with no risk at all. It does this with stocks, currencies, futures, and fixed-income securities. All told, Virtu makes markets in more than 12,000 financial assets. The ruthless efficiency at its core is most evident when you consider that it trades on more markets (230-plus venues in 35 countries around the world) than it has employees (148 at the end of 2015). You can read the whole article by seeing the link on the right hand bottom of this page under "Articles". Another hedge fund which has an identical achievement to Virtu is the Czech based RSJ. 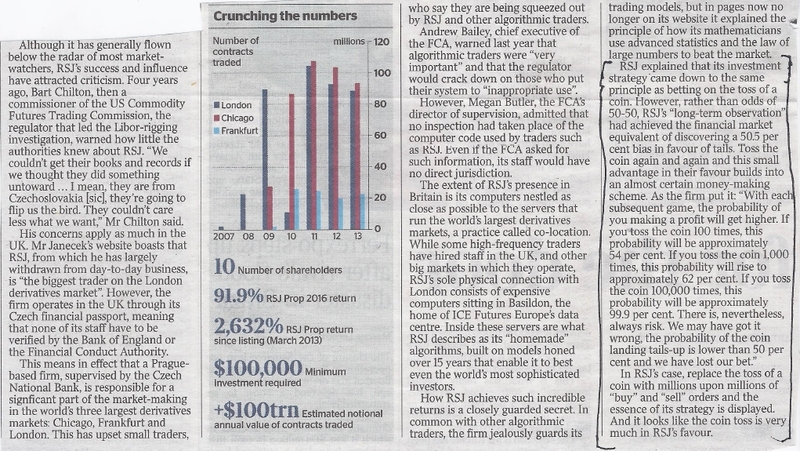 See below an extract that appeared in the UK Times on January 10th 2017 regarding the firms incredible achievements over the years using an algorithmic strategy that is based on the law of large numbers. Its an astonishing achievement considering just like Virtu the edge they have is just 51% yet it is the ability to find and place millions of trades per day which creates their positive expectancy. And this is why hedge funds like these that believe and align themselves with the law of large numbers experienced growth rates of over 20% in 2016 when the majority of the hedge fund industry lost -1.5% for 2016. However retail traders like you and me cannot possibly trade even hundreds of times per day. Its simply impossible. So the point is this. If you trade very few times and infrequently then you will be exposed to more randomness and variance in the way that probabilities play out. This will mean you will find it takes a much longer period of time to get to where you would have if you had traded more times. However what is the ideal sweet spot for trading set ups per day, per week, per month? I would say taking into account that over trading could actually end up doing far more damage to a human who is finite and experiences tiredness, emotional swings, and external factors, the sweet spot for me is around 4-6 trades per day. Its also important to add here that I am talking about high probability trades, not taking low probability or suspect trades just to meet the quota of making your maximum trade volume target. If I only have to take 1 trade per day because there is simply a lack of high probability trades then so be it. However when I make 6 trades and know I could take an extra 2-3 for the day then I will do it. The law of streaks more than anything was what prepared me for embracing uncertainty and the normal distribution of probabalistic trading results. I realized that just because a system may have a 60% win rate it doesn't necessarily mean in the first 10 trades you will get around 6 winners and 4 losers. It is entirely possible the first 5 or even 6 trades could end up as losses. Does this mean the 60% win rate is flawed? Not many traders or trading systems delve intensely on the subject of winning and losing streaks but for me it was fully engaging with this scientific phenomenon which helped me to understand that uncertainty was an un-avoidable part of trading and it was better to understand possible worst case scenarios of a trading strategy so that you could be mentally prepared when they strike. In the image directly below you are seeing the probabilistic results for a trading strategy which wins 60% of the time over a sample size of 60 trades. Accepting that anything above 1% could happen you will see that within a given distribution of 60 trades that it is possible to hit a streak of 15 positive consecutive trades (2.60%). It is also possible within 60 trades to have a streak of 8 winners in a row up to 3 times (1.10%). 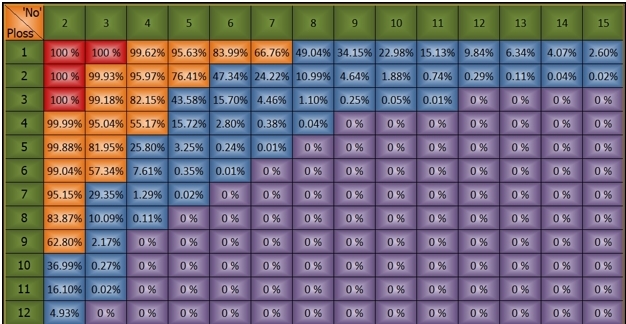 However the table below shows the probabilities of the same strategy with a probability of 40% of a losing trade. Accepting that anything above 1% could happen you can see that there there is always the chance in 60 trades that one could have a losing streak of 8 losses in a row (0.78%). One could also have a losing streak of 5 trades twice within a sample of 60 trades (1.40%). The contrast between the two tables shows that the odds of sustained periods of streaks clearly favours the first table representing winning trades rather than the last table showing losing trades. However by accepting that with a 1% chance of probability an event could happen it means that within a sample of 60 trades should one experience a losing streak of 7-8 trades you don't have to question the trading strategy because the streak behaviour falls within the expected range of probability. The final thing to bear in mind is that because the winning trades are twice the size of the losing trades it means even if one has a sustained streak of losses (draw-downs) that the biased probability towards winning trades means that it doesn't take a long to recover from draw-downs. Also its more likely for an event to happen the greater the size of the probability. So for instance an outcome with a value of 50% or more is more likely to occur than an event which is below 10%. So clearly the strength of the strategy is weighted towards not just risk reward but also win rate. The best of both worlds.